My friend Michael, the property’s owner, is a sculptor and incorporated faces carved from wood, cast in bronze, and chiseled in rock, throughout. Even more thrilling than the weather-worn faces were the surprises that abounded within the garden. Each day I found a small treasure hidden behind a rock, hanging from a gate or nestled inside a planter. How fun to find a new surprise to greet me each day! Which is your favorite? It is so impossible to choose! This entry was posted on Friday, February 20th, 2015 and is filed under Hearth. 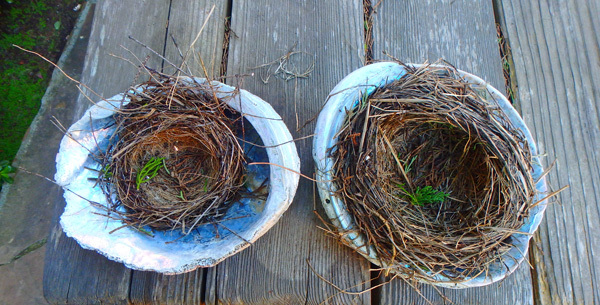 My favorite photo is that of the two round bird nests in the shells, each with their small sprig of bright evergreen. Hi Barbara, I love that one too! I found them only after a few days of poking around the garden, so a delightful surprise!